More than half of mobile device owners recognize that they use free public Wi-Fi spots to access the Internet. It’s convenient, free, faster than 4G, but dangerous. Is it possible to stay protected using free Wi-Fi spot? A short answer is “Yes”. A few simple but important steps will reduce the risk of intercepting your emails, passwords, credit card data etc., which are transmitted wirelessly. 2. Wi-Fi-sniffing. By using special tools and soft a cybercriminal can intercept internet data, which is transmitted between users and router and decode it to find the information? What he needs. 3. Brute-force. The hacker, by using special software picks up the password to the public Wi-Fi router and by controlling it redirects the traffic on his device to intercept and decrypt. 4. Cracking attack. Is the same as above, but hacker makes the router to give him the password of the administrator. This is the best way to take care of your safety. This way can’t make free Wi-Fi spot safe, but do save your personal information. You may use your own Wi-Fi router or cellphone as a router. Access to the Internet through the VPN provides the protection of your data which is transmitted encrypted through a virtual “tunnel”. Even the interception of encrypted traffic will not allow a criminal to decrypt the data to get your personal information. In the settings of device turn off the sharing option (ability to share files with others), disable the auto connection to open Wi-Fi spot and disable connection to ad-hoc network. Often we stay authorized in our social networking accounts, banking accounts, e-mail account, although we do not use them all the time. Before connecting and disconnecting to an open Wi-Fi spot do a full exit of each account that you have logged in. It is necessary to use two-factor authentication wherever it is provided by service (email, social media, online banking, etc). A criminal will not be able to intercept an additional password that will be sent to your cellphone. Do not connect to open Wi-Fi networks automatically. Enable the manual selection mode, to be able to choose a legal network. Enable the option “forget network” when you finish your work. 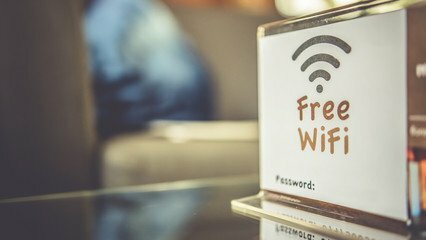 Make sure that the open free Wi-Fi spot to which you plan to connect is set legally and doesn’t have so-called “wild honey” that gives a cybercriminal the opportunity to intercept traffic of careless users. In addition, pay attention to the similar names of open networks (e.g. “ContinentGuest” and “ContinentGuests”). These facts may indicate the presence of a free Wi-Fi network, which is used to intercept personal data. Never use fake open Wi-Fi spots. When you look for information or watch the news on the Internet pay attention to the protocol that is used to connect to the websites. If the website’s address starts with “https” and green padlock is displayed on the left it means that the connection is secure and the encrypted HTTPS protocol is used. Otherwise, do not use this site for entering passwords or other important information. Before you start to work in the open public Wi-Fi network, enable the firewall and make sure that your software (OS, browser, firewall, antimalware) is up-to-date. None of these methods will protect you fully if you do not use common sense during working on the open Internet via free Wi-Fi spots.